I purchased this product so my wife and I could make corn bread yesterday. Read to find out what I thought of it. Product Description: Pre-packaged corn muffin mix from the Jiffy brand. The boxed product is made by adding water and egg then baking. I purchased this yesterday morning at one of our local grocery stores for 75 cents and my wife prepared it yesterday evening (making it as a loaf of bread rather than muffins), so we could eat it as part of our dinner last night. It had been a while since I had pinto bean stew and, figuring it would be something I could easily make in our slow cooker, I ended up making that for dinner last night. However, while I was looking forward to the beans, I realized it wasn't going to be complete without some cornbread to go with it. 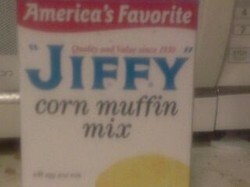 So, while I was at the store yesterday morning, I picked up a box of Jiffy Corn Muffin Mix. There were two main reasons why I chose to buy this particular product. The first, and main, reason was definitely the price. The box was just 75 cents, something that was pretty impressive when you figure there are very few food items that are under $1. The other reason I purchased this product was the brand name. We've used other Jiffy mixes in the past and have never had any complaints about them. As a result, I was confident this one would turn out equally as well. And, as it turns out, I was right about that. One of my biggest concerns when I purchased this product was whether or not my wife and I would have time to make it. We both had to work yesterday and our daughters had figure skating practice yesterday evening. As a result of that, I actually ended up looking for pre-made cornbread prior to purchasing this product (I was not successful). However, my wife was able to find a few minutes to add the called-for egg and milk to the boxed mix after she got home from work and the cornbread was done by the time she had to take the girls over to the rink. This worked out well because it was ready (and still warm) when we got home and were finally able to have dinner. As far as overall quality goes, as I mentioned, much like the other mixes we've bought from this brand, I had no complaints. The bread had a great taste to it and was soft and moist, even after it sat out for a while (I ended up having some of it for lunch today). In other words, it was definitely worth the small amount of money we spent on it, especially since we had enough for all of us. This was a last-second decision but, as I was pretty much expecting, was a good choice. It's a product I definitely would recommend if you're looking for a cornbread mix and don't want to spend too much money.